How do you count a population of small animals across an island, when they are so well camouflaged? 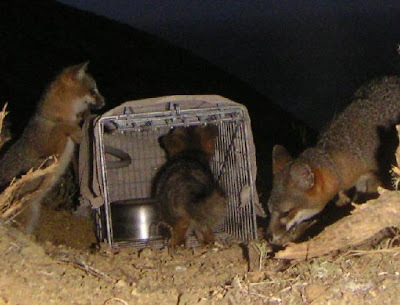 Each July to December, across the six Channel Islands where island foxes live, biologists put out special capture cages to catch individual animals. These wire box-traps have a door that snaps shut when the fox steps on a trigger plate at the rear of the box. The number of cages put out each night and the manner in which they are arranged differs between islands and land managers. Tim Coonan, senior biologist for Channel Islands National Park explains that on Santa Rosa and San Miguel "Traps are deployed in small grids." These grids typically are stretched over rolling hills. The grid pattern may be two traps by six traps wide or three traps by six traps wide. The capture-trap locations are spaced approximately 250 meters apart with the capture cages usually under bushes or scrub. The cage is covered with burlap to further protect the fox from the elements. Cages are baited with fragrant substances particularly interesting to island foxes. Each cage has food and water. The grid of cages is checked each morning. Foxes in the cages are first scanned for their microchip ID. Biologist Calvin Duncan explains why this is important. 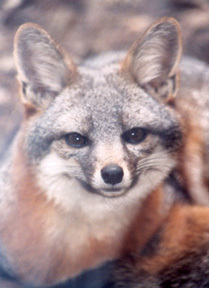 Each individually identified island fox is counted. This year's pups are counted separately to determine an estimated fertility rate. Pups born in April are old enough to be on their own, but they usually are somewhat smaller than adults and will not yet have received an ID microchip. While in-hand, the island fox receives a health check, vaccinations and an ID microchip or radio tracking collar if needed. 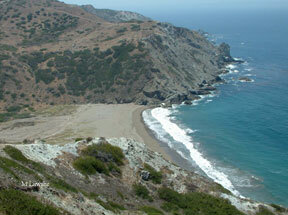 On Catalina Island capture cages are put out along lines called "strings." On mountainous terrain, strings of cages are more practical than grids. 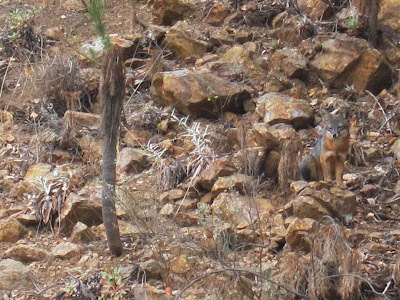 On all of the islands, actual numbers of individual island foxes caught during the fall are entered into various population modeling software to determine the best estimate for the total population. After strenuous weeks of counting in the field, it takes months in the office to produce reliable numbers. That is why the number of island foxes counted in the fall becomes official in June of the following year. 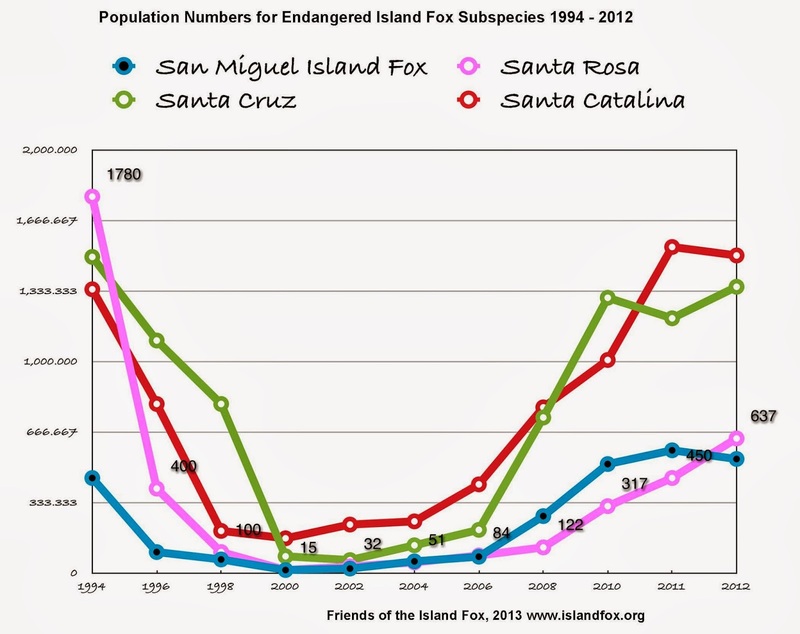 These are the official island fox population numbers through fall of 2012. 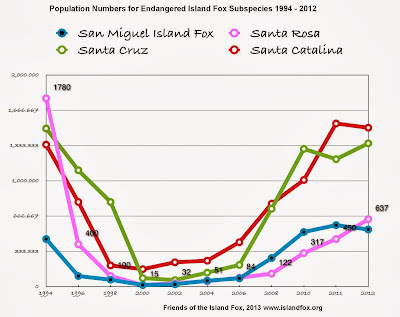 Notice how Santa Catalina and San Miguel both showed slight population drops last year. Biologists believe this a sign the populations are stabilizing at their natural levels. Drought this year may impact populations as well. Notice too how Santa Rosa is finally showing robust population increase. We hope this population will continue to recover. Whether the numbers are up or down, counting island foxes is the only way we can have the best estimate of population recovery. The self-contained, lockable trunk comes with a variety of biofacts, like skull replicas and footprint casts. 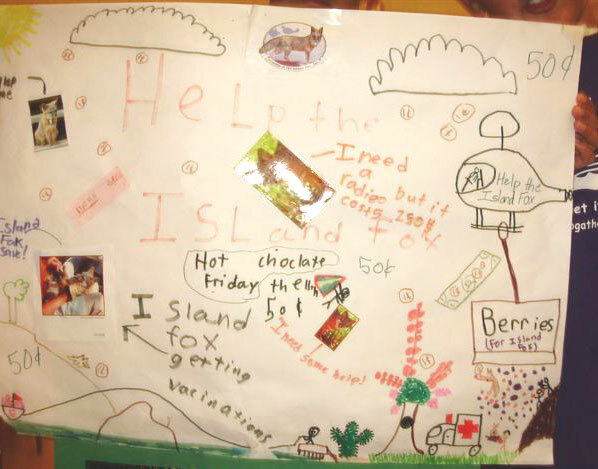 Students can compare the island fox to its ancestor species the gray fox or to larger relatives like the coyote and the gray wolf. 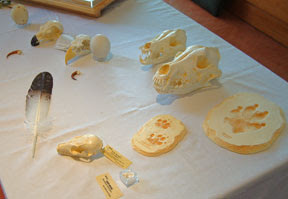 Compare bald eagle and golden eagle skulls and eggs. How do they match up to the island fox? The trunk also comes with a notebook of educational activities, videos, island species information and even art projects. 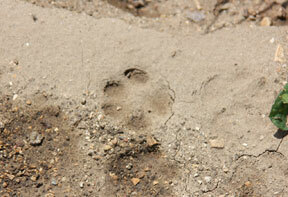 Create a story using footprints from predator and prey animals on the Channel Islands. Cast prints of fox footprints or make origami foxes. The Teaching Trunk is checked out on a first-come basis for a two week interval. Check out is FREE but an individual will need to sign an agreement of responsibility for the return of items. Schools involved with the Fox Ambassador Program or with scheduled classroom visits receive priority.